Puskas, Kocsis and Hidegkuti...the list goes on of world-class players and Hungary's disposal. From 1950, Gusztav Sebes had instilled a ruthless animosity to the Magyar's game. The attacking nature adopted by Sebes resulting in a 3-2-1-4 formation. From 1950-1956 the Hungarians would play 50 games...their record 42 wins, 7 draws and only a single defeat. The match they lost? The 1954 World Cup Final to West Germany. 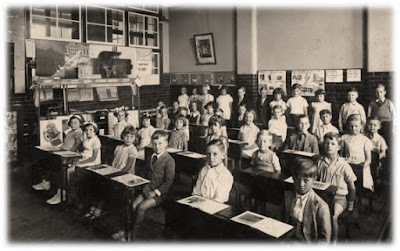 The story of the Miracle of Bern or Das Wunder von Bern is an amazing story for the way Germany won, but also how the Hungarians lost. In 1953 the Mighty Magyars came to Wembley, expected to lose to an England team only defeated once to foreign opposition on home soil in over 60 years! The British press billed it as the Match of the Century - The world's finest team against the originators of the modern game. From the first minute of the match, the early form of "Total Football" was triumphing over the rigid nature of the English tactics. 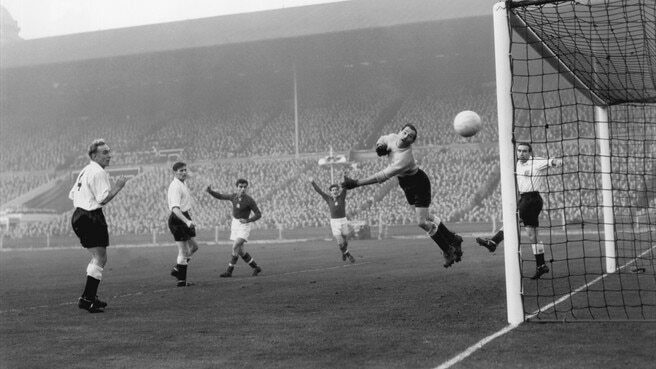 A Hidegkuti hat-trick, a brace from Puskas and a solo goal from Bozsik provided a brutal eye-opener for England and the tactical nous of the English game. The final score was 6-3 and a game without doubt living up to its pre-match billing. England even attempted to gain revenge before 1954, only to be humiliated again, this time on Hungarian soil 7-1. The reason for the example of Hungary v England? To highlight the dominant, ruthless and unforgiving nature of the Eastern European side. 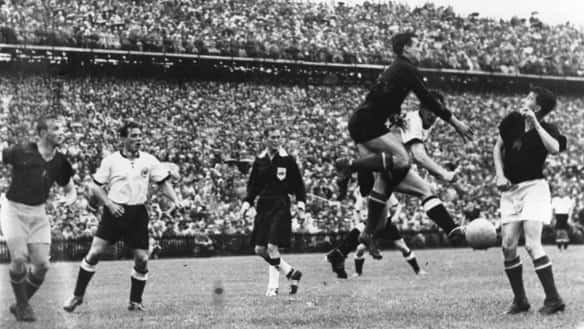 Arriving at the 1954 World Cup, surely nothing could stop Hungary from taking the Jules Rimet trophy home, not least a West German side unseeded and an admittedly weakened side mercilessly beaten 8-3 in the first group stage by the Magyars. The 1954 tournament would be only the second World Cup to take place since the Second World War. 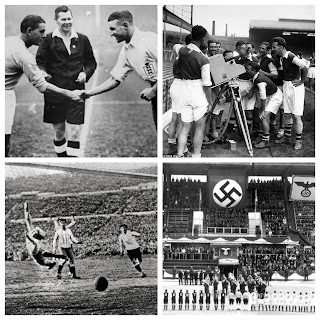 The West German side only allowed to become a member of FIFA in 1950 and still feeling the force of European hatred for the events not long in the memory. The routes to the final couldn't have been much different. Hungary and Germany both were drawn in the same group alongside South Korea and Turkey. Hungary were first to qualify, scoring a total of 17 goals in their two group matches - 9-0 vs Korea and the aforementioned 8-3 demolition of Germany. The West Germans needed a play-off victory over Turkey (7-1) to ensure qualification to the quarter-finals. The goals would not dry up in the knockout stages, Hungary defeated first a strong Brazilian team 4-2 and then reigning champions Uruguay by the same scoreline. Sandor Kocsis increasing his goal tally in the tournament to 11 in the process. West Germany gradually began to show form, firstly scraping past Yugoslavia, thanks to an own-goal and a late goal from Helmut Rahn, before showing their true pedigree by convincingly beating Austria 6-1 in the second semi-final. Max Morlock becoming the German pin-up boy in the process. The scene was set. 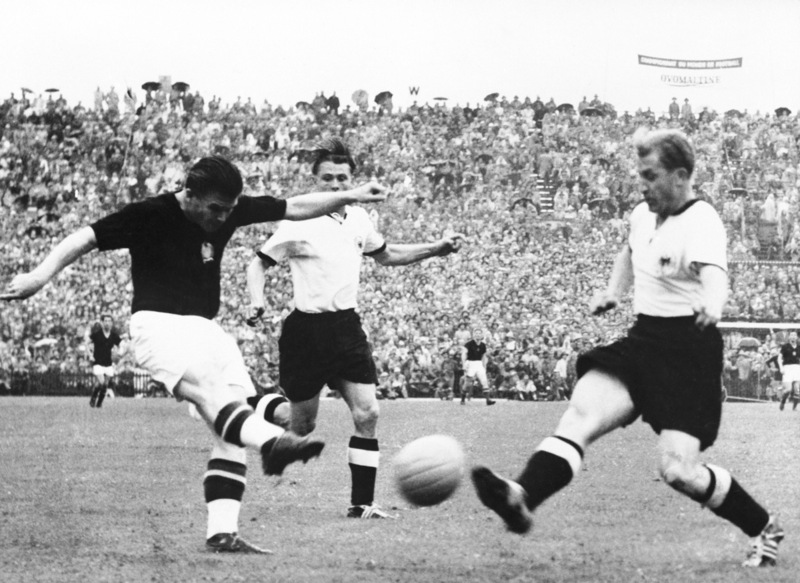 Hungary v West Germany, 4 July 1954, Wankdorf Stadium, Bern, The World's greatest team against the World's enemy. East vs. West. Capitalism vs. Communism. tournament...an injured Ferenc Puskas and winger Zoltan Czibor supplying the sucker punches for the German team to deal with. Even it the "Fritz Walter weather" of torrential rain the Germans seemed to be drowning in a pool of Magyar pressure. However by the 18th minute the tie had transformed, complete with their Adidas boots (designed for any weather) the West Germans had brought the game level to 2-2, Morlock and Rahn scoring the goals and seemingly representing a team more than a match for their Hungarian counter-parts. Sepp Herbeger's side would hold almost the entire second half, Toni Turek making a string of saves to deny to "Golden Team". 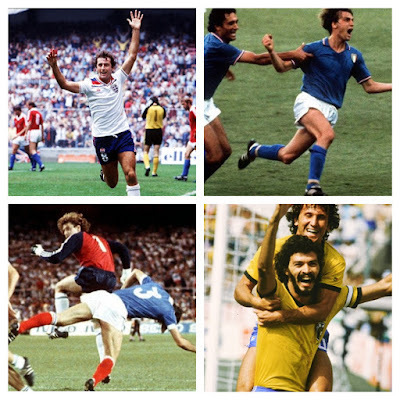 Then in the 84th minute, West Germany scored, the comeback was complete. Helmut Rahn provided the goal which 8 minutes in seemed impossible and provided the world's media with the headline "The Miracle of Bern". The global reaction was that of disbelief, The Mighty Magyars had been defeated. The victors were the World's enemy West Germany. A wave of euphoria captured the West German states - not only for the victory but for what it would mean for its future. Historian Joachim Fest regards the triumph as a turning point for West German history, due to the new found respect from the final's global audience for its efforts to comeback from 2-0 down and 8 years of political, social and economic turmoil. The final in Bern was the first time the German anthem was played since the War, symbolizing the turning of the tide for Germany. West Germany would go on to win two more World Cups by 1990 and the Mighty Magyars would slowly decline due to their own countries problems and the gradual exodus of top players to escape the increasingly totalitarian communist regime Hungary was subject to. Recent studies have suggested that the West German victory may have been due to doping and Ferenc Puskas' 89th minute "equalizer" may not have been offside. Being a football purist I would like to think both were not true in order to bask in the memory in one of football's greatest games. The lifting of the Jules Rimet Trophy by captain and former POW Fritz Walter really personifies the change in fortunes for West Germany and the resurgence after over 20 years of turmoil, dictatorships and millions of civilian deaths. Although West Germany would go on to receive another 36 years of instability, the efforts of Morlock, Rahn and Walter among others would go a long way in easing the hearts and minds of Germans and indeed the opinions of those who witnessed the "Miracle of Bern", further exemplifying the power football can have in uniting bonds deemed broken. "AUS! AUS! AUS! Das spiel is aus! Deutschland ist Weltmeister, schlagt Ungarn 3 zu 2!"